Did HMRC abuse the Liechtenstein Disclosure Facility? I've discussed before whether or not HMRC were right to let HSBC customers whose identities were only known to them as a result of their inclusion on the 'Lagarde list' supplied to HMRC by France in 2010 use the Lichtenstein Disclosure Facility. The issue has, however, been bugging me and so I have come back to it again. 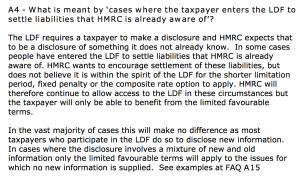 The Lichtenstein Disclosure Facility (LDF) has, admittedly, been revised since it was first issued, but since the latest version reflects what HMRC suggest is the correct interpretation of its use it is to that version that I am referring, because if any previous version was inappropriately applied the subsequent revision would, in any event, represent an admission of previous error on HMRC's part. It is also the case that they say it cannot apply where criminal conduct is involved or where prosecution is likely, but the conditions are clearly not meant to be alternatives: both preclude the use of the LDF and so it is the above note that is most important in the HSBC disclosure situation. 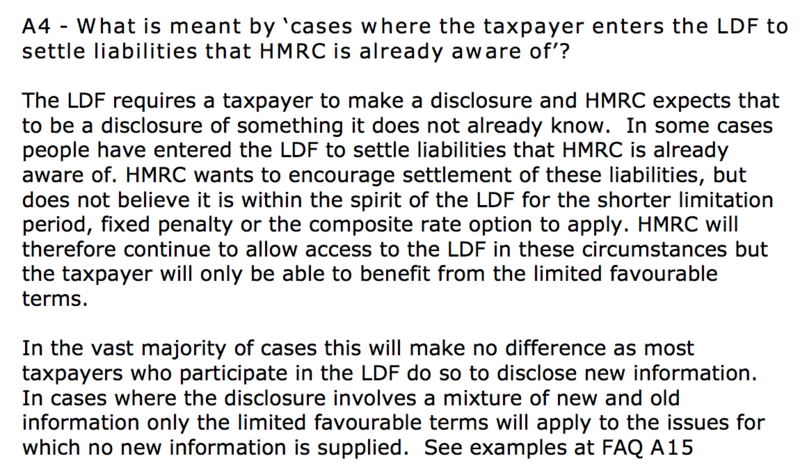 And let's be clear: the LDF was defined as a disclosure facility. By definition then it only applied to situations where people voluntarily came froward to declare their liabilities. It could not, and should never, in that case have ever applied to cases where the taxpayer did not make the disclosure and instead HMRC had to find that tax was due by them, as is true in the vast majority of the Lagarde HSBC list cases. In other words, by its own admission HMRC should never, as Lin Homer said it did, direct HSBC list taxpayers to the LDF so that they might make use of it to mitigate any part of their liabilities arising out of the HSBC disclosures, whether to tax, interest or penalties. That was an option not available to them or HMRC. And if that did happen then HMRC acted ultra vires i.e. beyond its legal powers. I do not think that means that those who have settled in this way can now claim that they should not be required to pay as a result, although I can just about imagine some lawyer trying that on. But it does mean that those in HMRC who permitted this are accountable for their own failures to exercise the powers entrusted to them. I think that would only apply to Commissioners of HMRC who were aware of this, but all of those Commissioners who were aware in that way appear to me to now need to be subject to serious disciplinary action and the possibility of dismissal has to be on the cards. HMRC cannot be seen to be abusing its powers to help tax evaders but that is exactly what looks to have happened here. And that necessitates an urgent review, now. I fear that it is too late for serious disciplinary action: it is likely that the senior staff responsible for these decisions have ‘descended from heaven’. The term’s literal meaning, “descent from heaven”, refers to the descent of the Shinto gods from heaven to earth; the modern usage employs it as a metaphor, where “heaven” refers to the upper echelons of the civil service, the civil servants are the deities, and the earth is the private sector corporations. In amakudari, senior civil servants retire to join organizations linked with or under the jurisdiction of their ministries or agencies when they reach mandatory retirement age, usually between 50 and 60 in the public service. The former officials may collude with their former colleagues to help their new employers secure government contracts, avoid regulatory inspections and generally secure preferential treatment from the bureaucracy. There are, of course, procedures in place to ensure that there is nothing improper in such appointments. The practice of Suberi or ‘sideslip’ is somewhat harder to pin down: perhaps you (or some promising student with a dissertation to write) could ask one of the Big Four accountancy firms for case studies on the value added to the private sector by successful civil service managers bringing their skills and specialist knowledge across from the public sector. Phrase your question as if you’re praising the practice, and you might get more than you expected. I am both stunned and disgusted with the goings on at HMRC. Heads should definitely roll and whoever takes over instructed to reconsider the HSBC client files again to determine whether any further revenue is due. Lyn Homer has to be top of the list for the chop. In fact she never should have been there in the first place after leaving such a mess at UKBA. It makes my blood boil to think how much money she earns at HMRC and then has the bare faced cheek to tell MP’s she deserves a £20,000 bonus on top of her salary while most of those whom she commands are on a pay freeze. But no doubt she will talk her way out of this the latest in a line of misdemeanours under her watch. I think the policy of ‘suberi’ of B4 not-so-ex-employees into government, both UK and EU, needs much greater scrutiny.